At the time of the interview, Sion Daniel Young was playing the role of Albert Narracott in War Horse at the New London Theatre, this is what he had to say. When did you first discover that you really enjoyed acting? I always enjoyed improvising so I think that’s where it began. There’s also a Welsh language festival in Wales called ‘Eisteddfod’ which I used to participate in, performing sketches and monologues. Did anyone in particular inspire you to head for a career in the performing arts? I was fortunate to have some great teachers that I learned a lot from, and they gave me advice that I still abide by today. You trained at the Royal Scottish Academy of Music and Drama. What is your favourite memory from your time there? Graduating was pretty special. I had a real sense of achievement and as a three year experience, I’ll never forget it. Within your television credits you have appeared in Casualty. What was it like appearing in such a popular national television series? It was great, mainly because it was shot in Cardiff and it meant I got to spend some time at home, away from London. 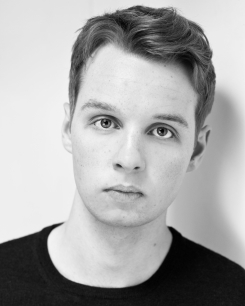 You have appeared in several films including Private Peaceful. What have you enjoyed most about working in front of a film-camera? I’ve been really lucky to get to work with some fantastic screen actors, so getting an opportunity to learn from their work is definitely the most enjoyable part of it. The catering tends be pretty special too! You had several theatrical roles before your current one. Which one was the most challenging, and which one the most enjoyable? ‘The Radicalisation of Bradley Manning‘ with the National Theatre of Wales was the most challenging play I’ve been involved with due to the physicality and the multi-roles element, but the bigger the challenge the more rewarding it tends to be. As for enjoyment, a play called ‘Tribe‘ with the Sherman Theatre has to be top of the list. It was a new play and we had a great cast and fantastic crew. You are now playing Albert Narracott in War Horse. Was there anything in particular that attracted you to the role? I’d seen the play back in 2010 and instantly knew I wanted to be a part of it. It was the most memorable theatre experience I’d ever had. How arduous was the audition process? I had to do three rounds in total, where I met the casting directors and the show directors, before finally working with Joey on the stage. In total it only took a week from the first meeting to being offered the part which is great because you so often have to wait months on these type of jobs. How have you ‘created’ your Albert? I’d always had an idea of how I wanted to play the part so I’ve stuck with many of those choices, but the text is my main indicator of who Albert is. How hard is it following in someone else’s footsteps in a major role such as this? I don’t think about the previous actors that have played Albert because the only important thing to me is creating my version and committing to the choices and decisions I’ve made. We’re encouraged by the directors to find new things and not be influenced by previous performances. What is it like working on stage alongside life-size puppets? The puppeteers are so skilled that the puppet is alive at all times which makes my job so much easier. I, like the audience, forget that it’s a puppet and see Joey as a real horse. Have you had any previous experience of working with horses? How have you prepared for this role and your interaction with Joey? I’d never worked with horses before this but when I got the part I started watching footage of horses constantly and visited stables just outside London to get to spend some time with real horses and learn how they react to a human in their space. What do you enjoy most about being a part of this moving play? It had a profound effect on me when I saw the play, so to be a part of it now and know that I have the potential to make others feel the way I did is what I enjoy the most. Why should everyone come along to see the play? Because as a past audience member, it’s an experience I’ve never forgotten for all the right reasons. Cinema and pub. In that order.